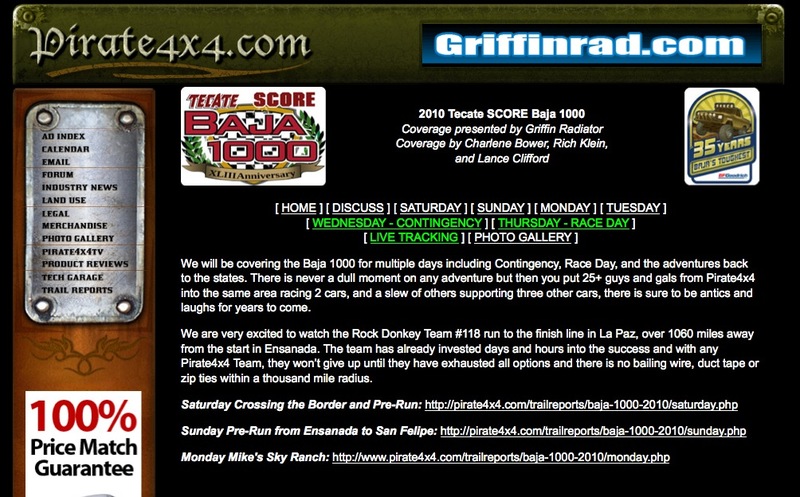 GEORGETOWN, CA – NOVEMBER 17, 2010: Pirate4x4.com will be hosting coverage of the 2010 Tecate SCORE Baja 1000. The coverage team will bring you the lifestyle of pre-running, contingency day interviews, and interactive race day coverage as we start in Ensanada and run to La Paz, over 1060 race miles to the finish line. Coverage pages will be updated daily starting Saturday November 13 at http://www.pirate4x4.com/trailreports/baja-1000-2010. Race Day coverage will begin Thursday morning and will include a live chat where we will be uploading pictures and information instantly from the course, at the pits, and on the road. The focus of the coverage will be on Team Pirate4x4’s #118 Ultra4 car that will be running in Class 1 under driver of record Dave Cole. We will see what it takes for a group of commonly known rock racers to take on one of the top classes in the most highly acclaimed races in the world. We will also be following the team progress of Roger Norman and Lance Clifford in the #8 Crystal Bay Casino Trophy Truck, JT Taylor’s #601 Torchmate Class 6 truck, Jason Scherer in the Wide Open Baja BFGoodrich car, and Mike Shaffer’s #1700 Torchmate JeepSpeed. We will watch their progress and all the battles within the classes. We will also report on any other vehicles that we run into along the way ensuring a good width of information. After the race we will be posting additional video and pictures as well the adventure back to the US. The team of Charlene Bower, Rich Klein, Jessi Combs, Lance Clifford and others will be feeding information throughout the week to bring the most information on the internet to Pirate4x4.com.